* Editors note: TOWNHALL News Editor Katie Pavlich is participating in a multi-day firearms training course at the Gunsite Academy in Paulden, Arizona. Stay tuned for daily dispatches. The fourth dispatch is below. As the dispatches accumulate, they’ll all be available here. PAULDEN, Ariz. – Sunday was my third and final day of the Gunsite carbine course and the focus was on versatility of different weapons during a fight, knowing your environment during a fight and threat simulation. In the morning, my instructor Dave taught me how to properly transition from my carbine to my handgun in the middle of a fight should my carbine fail because of a malfunction or lack of ammunition. In training, a pistol holster is used on the right hip with a pistol ammunition holster on the left hip. An ammunition holster for carbine magazines is also on the left side, just behind the pistol ammunition holster. Got that everyone? 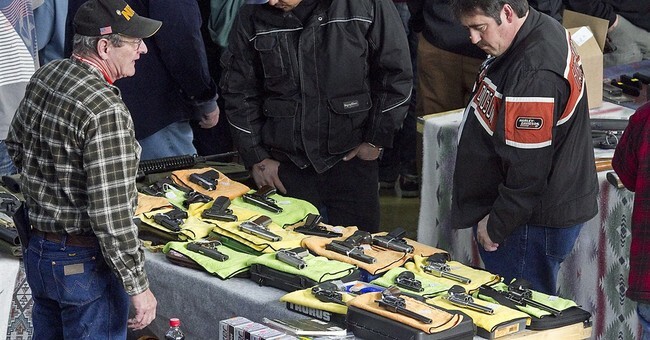 Don’t tell the gun grabbers, they’ll be trying to regulate not only how many rounds of ammo you can bring to a fight in self defense, but how many guns you’re allowed to bring. Anyway, onto the transition from the carbine to the pistol. The transition begins when the carbine fails to fire. The left hand (if shooting right handed) is then used to safely guide the carbine down to the left side of the body. Why? If you drop a slinged carbine without control onto your body, it is possible to injure yourself which either takes you out of a fight or injures you, both are obvious disadvantages. After this step, you then acquire a firm grip on your pistol and bring the left hand to the middle of the body. 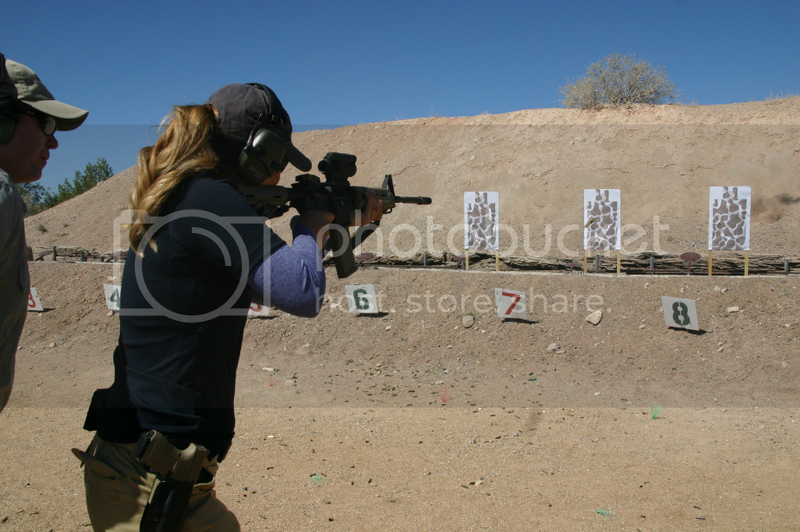 Click here for more on gunsite training, including Katie Pavlich’s photo gallery as she navigates the training course! From there, you’re ready to unholster and prepare to fire. When firing on a threat, the standard response is two shots, which can be achieved in two ways, as a controlled pair or as a hammer pair. A controlled pair is two shots with a site reset in between, meaning, you take the time to reset your sites on the threat before the first shot and after the second shot. A hammer pair is two quick shots with no site reset between the first and second shots. In a close-quarters, self defense situation, a hammer pair is generally used. As always, while all of this is happening, the carbine malfunction, the transition, etc. it is extremely important to remain mentally focused and calm. One of the most challenging things I had to do over the course of my carbine instruction was operating in a simulation-house full of threats. The one at Gunsite is the size of an average home and cardboard figures have been set up inside of the rooms. Some are threats holding guns, some are not. Part of the mental training I went through was determining under stress who was a threat and who was not, whose actions I needed to stop and whose actions did I not need to stop. My instructor Dave taught me how to operate inside of the house with my carbine. I learned how to clear a room, what angles to take when opening doors, how to avoid over exposing my body to a potential threat and how to move effectively inside the house. Because a carbine is a long gun, in certain parts of the house we used what is called an “indoor ready” position. This is when the carbine is held down and tight against the body. This allows for movement in tight spaces and to avoid exposing to a threat your position. ?Back out on the range, because a typical home invasion involves three people, I learned how to manage three different threats at once. Monday I’ll start the five day 250 pistol training class. I’ve been told that once I complete the course, I’ll never walk to and from anywhere the same way again.